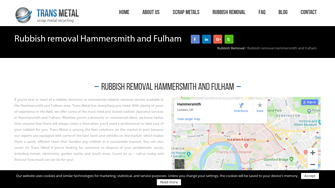 Do you need the help of experts for your rubbish removal in Hammersmith and Fulham? Trans Metal Company is the right place for you! We deal with all kinds of rubbish - residential, commercial and construction. What is more, Trans Metal offers the best rates available in London. We always put the clients' needs first and work to their complete satisfaction. Trans Metal consists of specialists who have huge rubbish removal experience, are reliable and friendly.